Forgive me, Bloggers, for I have sinned – it’s been a week since my last blog post….but with good reason. I had faithfully recorded images of my week for #sundaysevens (including some lovely Spanish sunsets) but could not share them with you…yet. It is in the gadget hospital as we speak so, hopefully, the techy bloke will work his magic and retrieve some of the lost photos for a later post. As you know, we recently hopped over to Andalucia in Spain for a couple of weeks to stay with my Auntie and her partner. This is Auntie, looking very glamorous and stylish. Not your average ex-pat, I think you’ll agree. 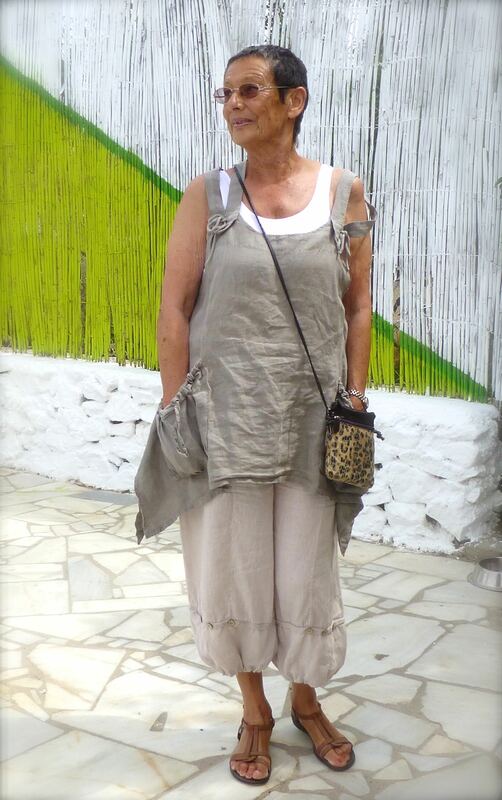 Boy, do I hope I’ve inherited her genes – hardly a grey hair in sight and she’s seventy-six this year! Auntie wears a lot of linen. With temperatures well into the high thirties in the height of Summer, it’s the coolest and most comfortable fabric to wear, after all, you can’t walk around naked all the time, can you? Having long admired this style of clothing, I persuaded Auntie to take me to the Tuesday market in Albox (photo amongst the many lost in the depths of my iPhone) to buy something similar in an effort to keep cool in the blistering heat. Apparently, it was a balmy 26°C and pleasantly cool for the locals. I was sweating my t**ts off. The Boys stayed at home frolicking in the pool for the morning whilst we spent a blissful few hours wandering around the market, stopping occasionally for Tapas and the odd chilled beer. I came back with a dress, one top, two tunics and two pairs of trousers, all Italian and made in 100% linen for €108, which is about £78! The remainder of our holiday was enjoyed in cool, linen comfort and I vowed to make more things in this magical fabric on our return to England. The wonders of online shopping resulted in this little lot being delivered within a few days of arriving home. I chose this fabric from Calico Laine, a blend of 55% linen and 45% cotton, in three shades, ‘Leaf’, ‘Fuchsia’ and ‘Pool Blue’. As I wasn’t entirely sure what I was going to actually make yet, I bought three metres of each which would be plenty for any single garment. 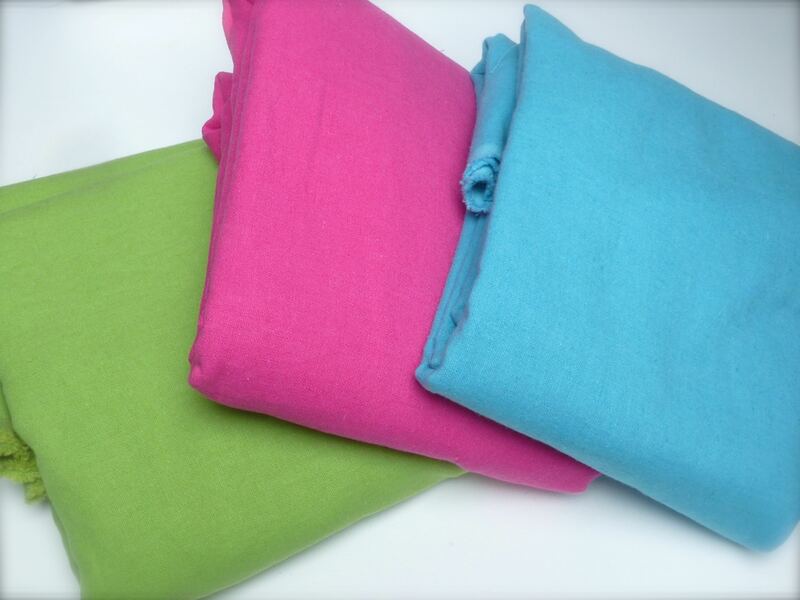 At £8.99 per metre, it is much cheaper than pure linen with the added bonus that it shouldn’t crease quite as much. Look at that lovely loose weave – fabulous texture! 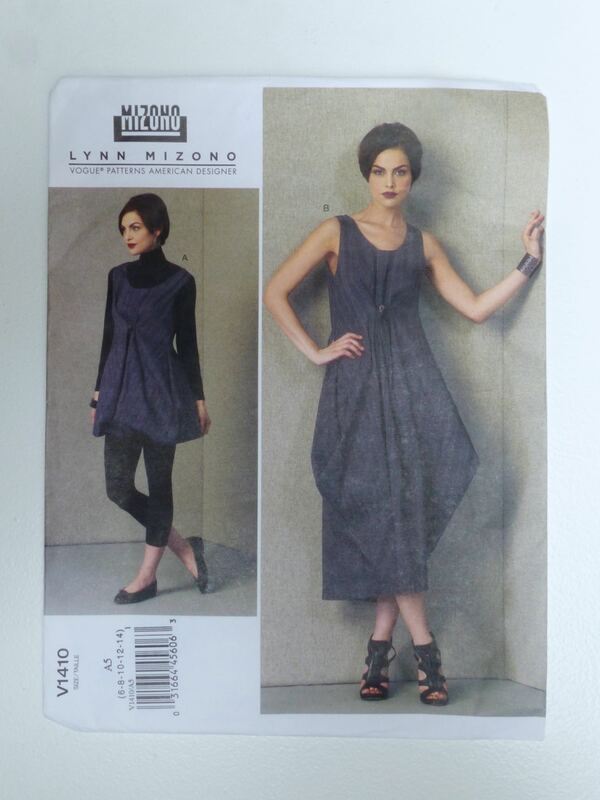 After having a mooch around online, I settled on this pattern by Lynn Mizono for Vogue. I love Vogue patterns, especially the ‘Designer’ range, as you’re always guaranteed to find something a bit different to the norm, which I like. 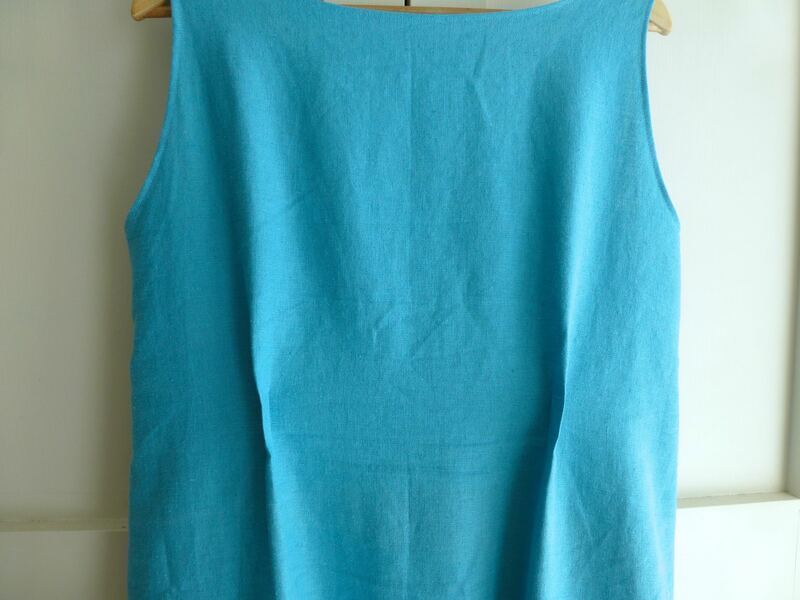 Whilst linen wasn’t on the list of suggested fabrics, silk dupioni was and, as they are similar in weight and characteristics, I knew it would be perfect for this design. Described as a “very loose fitting pullover dress……with three adjustable lengths”, it seemed ideal for the look I was after – something cool and comfortable to move around easily in, yet still stylish enough to make it look as if I’ve made an effort when clearly I haven’t. Then I realised I’d made a silly mistake – I’d ordered a size 14 forgetting that the US equivalent is a size 18! 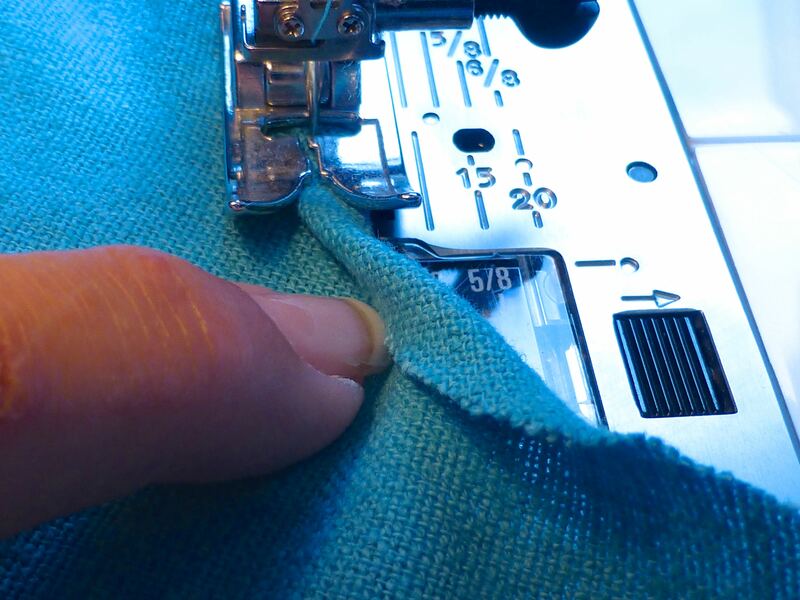 I added a couple of inches to the bustline and lowered the shoulder seams by half an inch – problem solved. 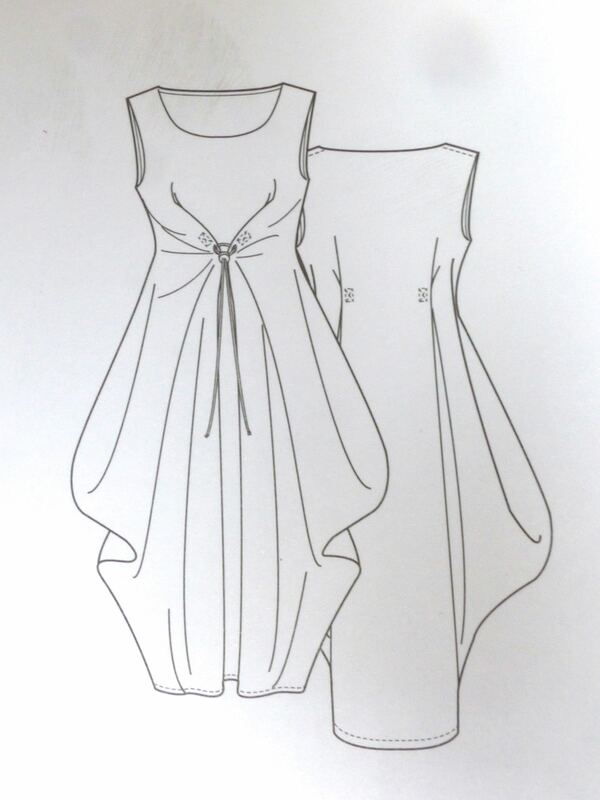 Construction was simple – just two pattern pieces; a front and a back. French seams were used throughout, making the seams nice and tidy with absolutely NO chance of fraying – a real problem with linen. 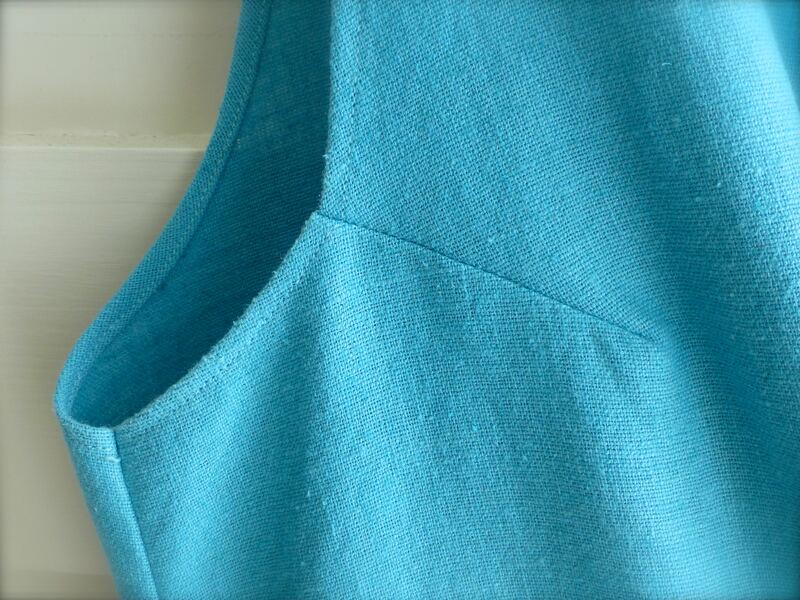 Narrow hems finished off the neck and armhole edges beautifully. 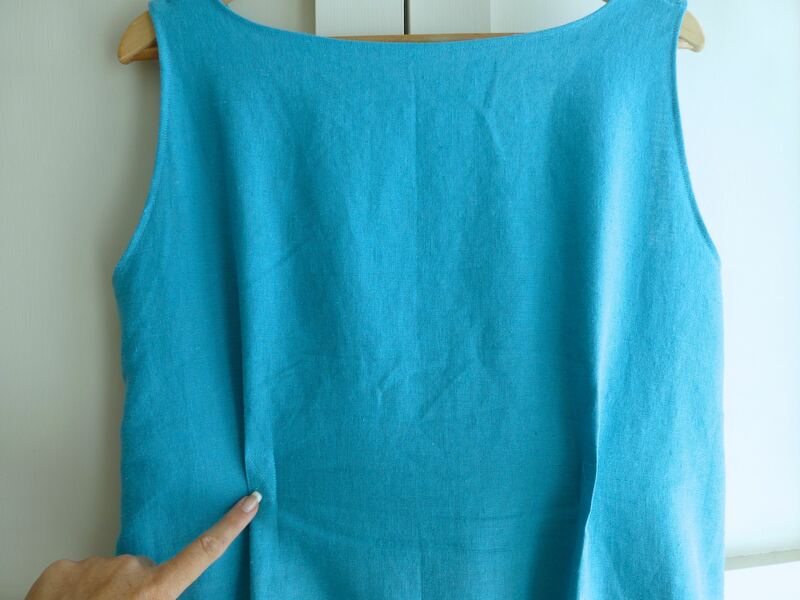 This finish can be tricky in other fabrics but, with linen, it’s very easy as the loose weave makes for a flexible fabric. I didn’t even bother pressing under the seam allowance first, just folded and pushed under the raw edge with my fingernail as I went. 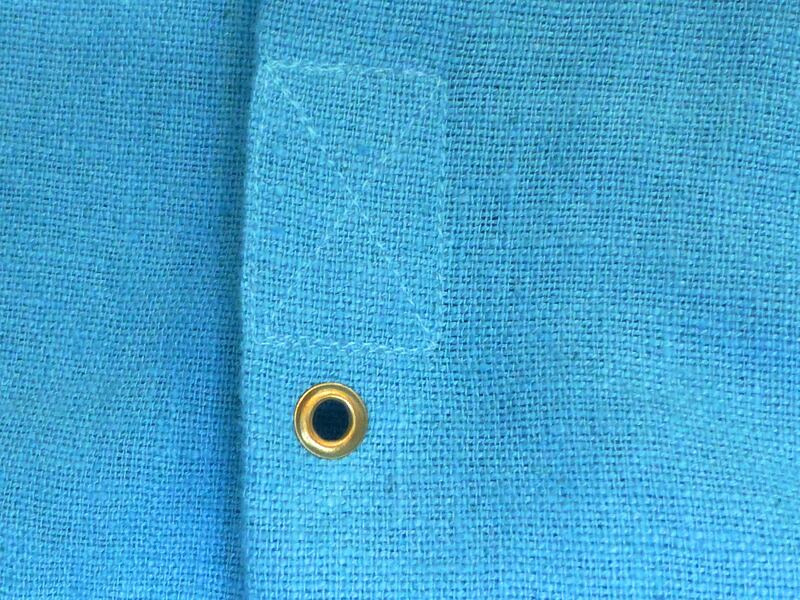 The instructions called for two buttonholes in the front pleats for the cord to pass through, but I replaced these with eyelets as I thought they would look neater and place less stress on the linen. I only had a lime green cord stop left over from the pack purchased when making this crocheted back pack. Hmmm…..I’m not sure whether to change if for a brown one. There were a couple of things I wasn’t happy with – the armholes gaped a little so I added a dart each side for a better fit. The back pleats are left ‘hanging’ according to the instructions. I’m wondering if they would look better stitched flat against the body. Overall, though, the finished dress is just as I pictured it. An interesting shape, casual but quite stylish. 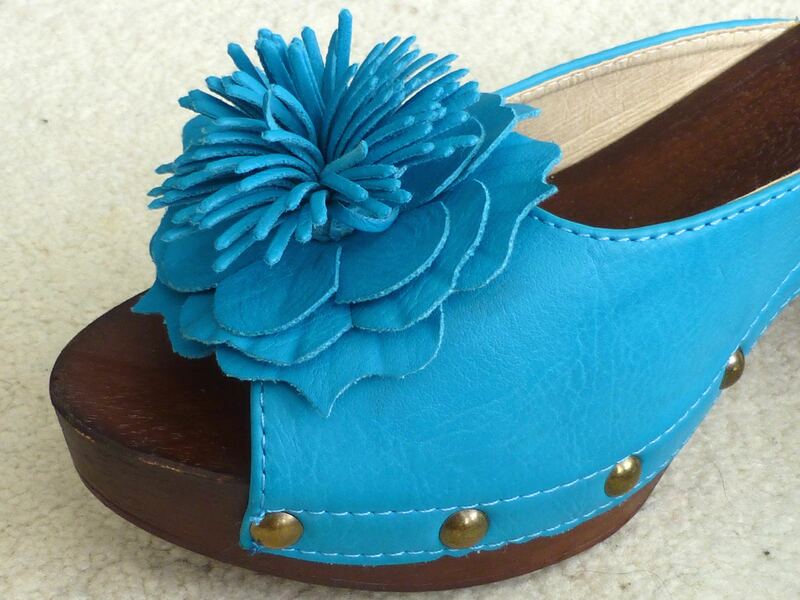 I bought these gorgeous clogs in another Spanish market a few years ago. 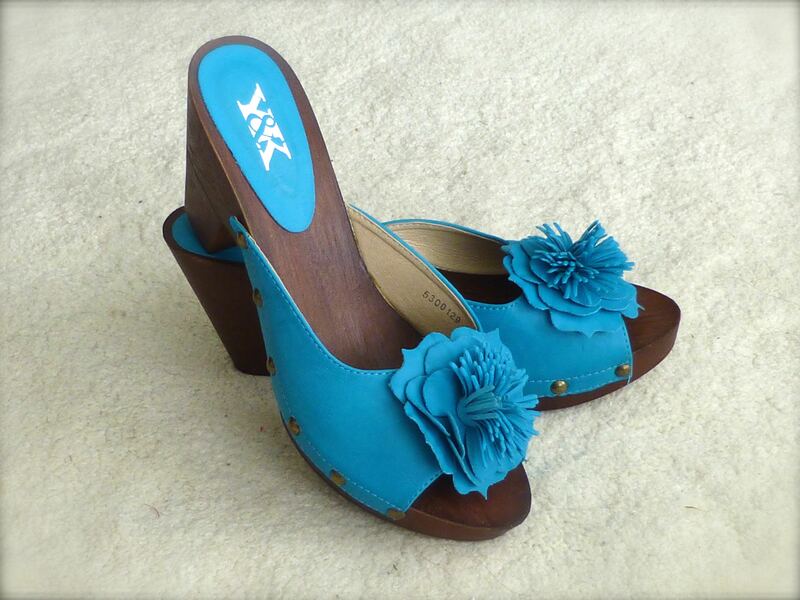 The perfect shade of turquoise that matches exactly! Of course, I forgot to put them on for the obligatory selfie…. 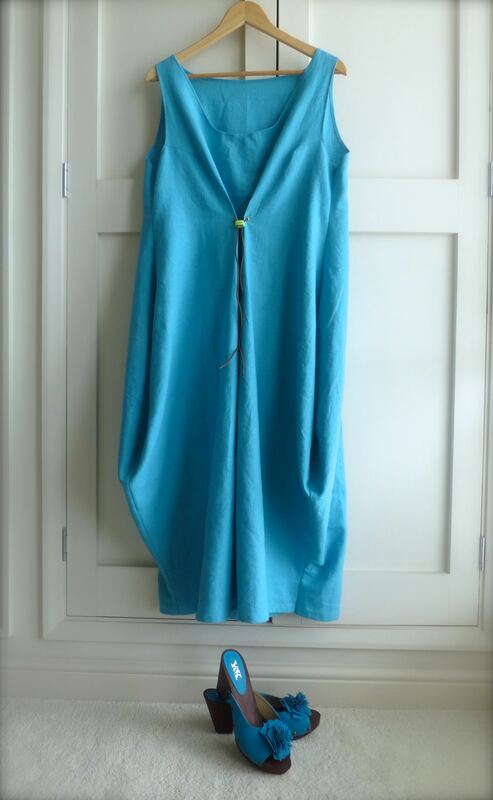 It’s pretty versatile, too – I reckon it could be dressed up for the evening with those clogs, a statement necklace and an up-do, or teamed with flip-flops, floppy hat and shades for a day at the beach (perish the thought – I hate sand!). 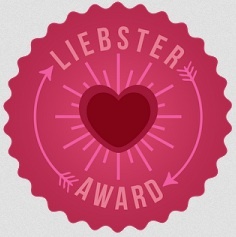 Right, now to catch up on all your blog posts that I’ve missed since the ‘phone died. 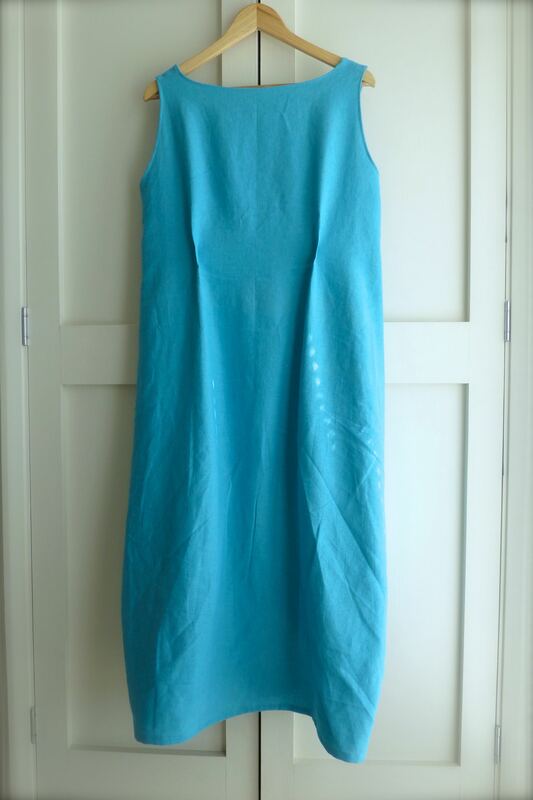 Categories: Sewing | Tags: Designer dress, dress, dressmaking, linen, sewing, summer dress, sun dress, sundress, Vogue | Permalink. Well, I think that dress could have gone one of two ways. Luckily it has gone exactly the right way and is a complete success! It looks superb and really flattering. What a wonderful and flattering design – love the colour and how it looks on you. Hope not all photos were lost. Thanks, I’m really pleased with the way it looks – much nicer than on the pattern envelope! I will find out about the photos later today…. Gorgeous, it looks so lovely and cool. 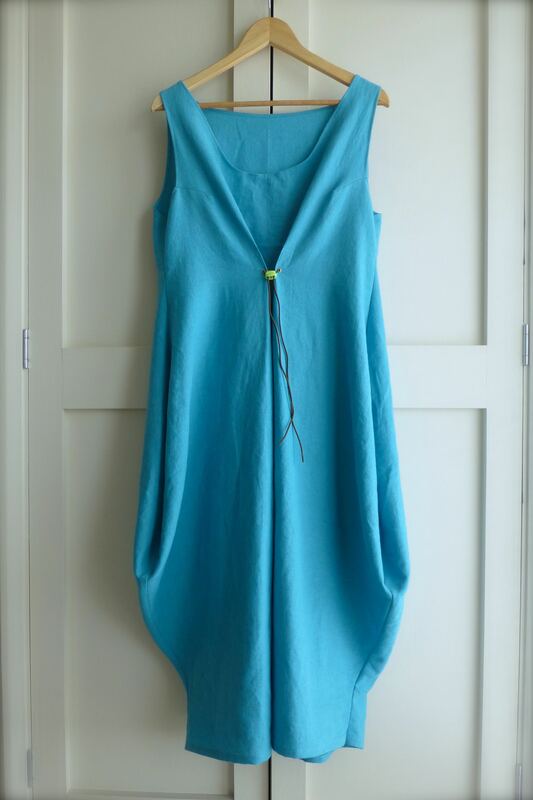 I have fallen in love with a loose style linen dress but it is rather pricey and also too short for me, you have now got me thinking about making one! 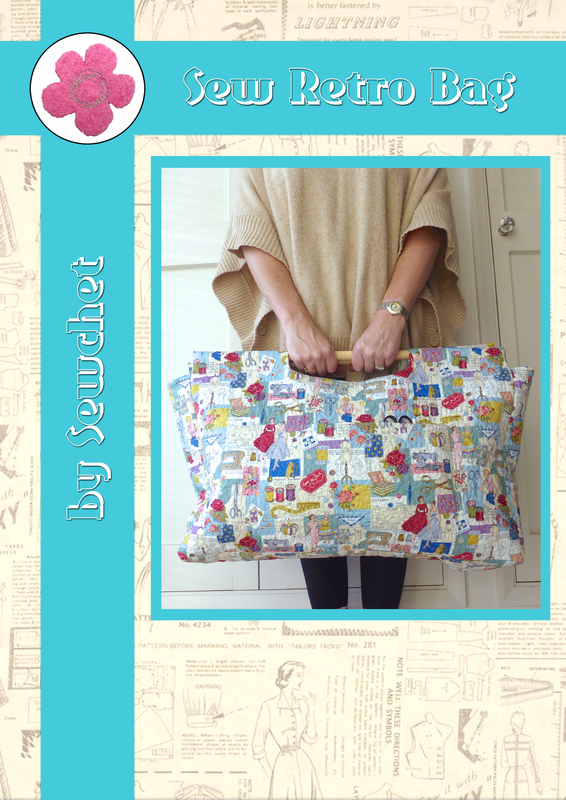 Take a photo of it and browse the pattern catalogues – there’s sure to be something similar that you could adapt to your style. 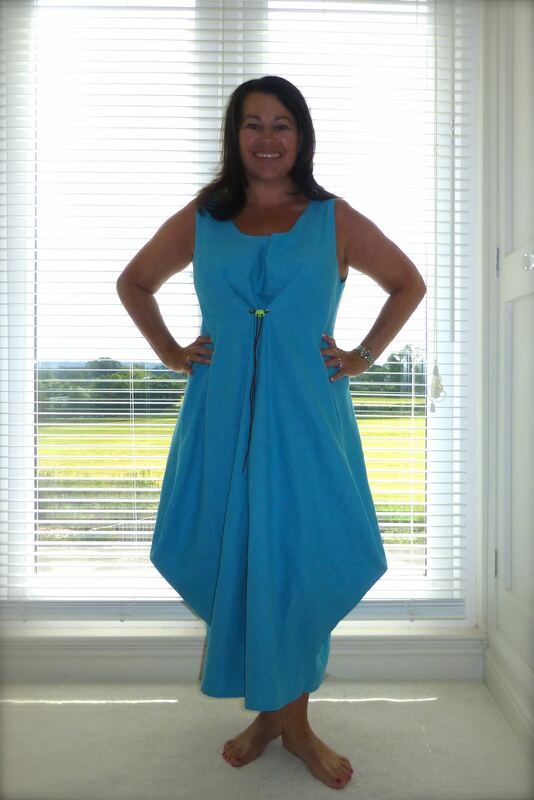 I used about 2 1/2 metres for this dress which means it only cost £22.00. What an interesting dress. So unique! I love it that we can sew unusual garments to suit ourselves. And I love Vogue designer patterns, too. I cut my sewing teeth on them as a teen back in the 80s! 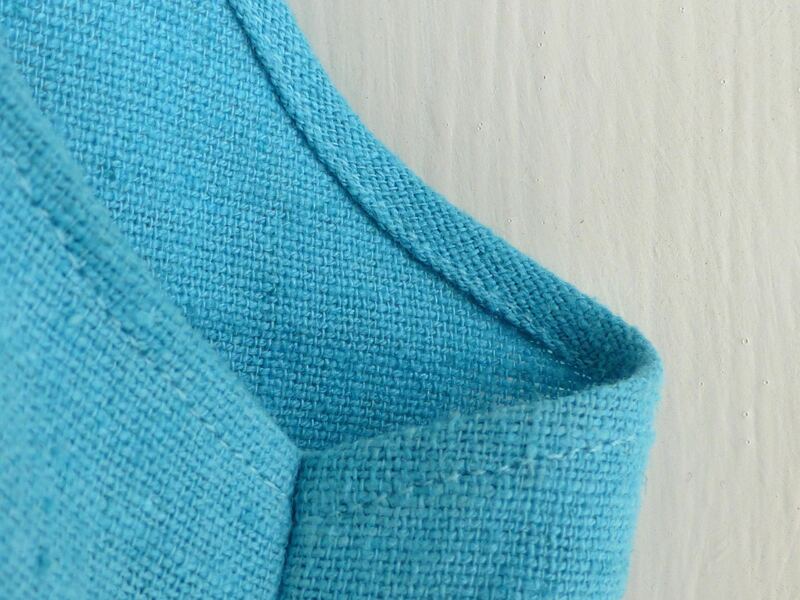 Isn’t linen divine to sew? Your dress is a gorgeous colour, and super comfy to wear, I bet. Ooh, I did too and they’ve been my brand of choice ever since! I’m wearing the dress now and yes, linen is a dream to both sew and wear. Cute dress- I would never have expected something like that, but it’s really interesting! 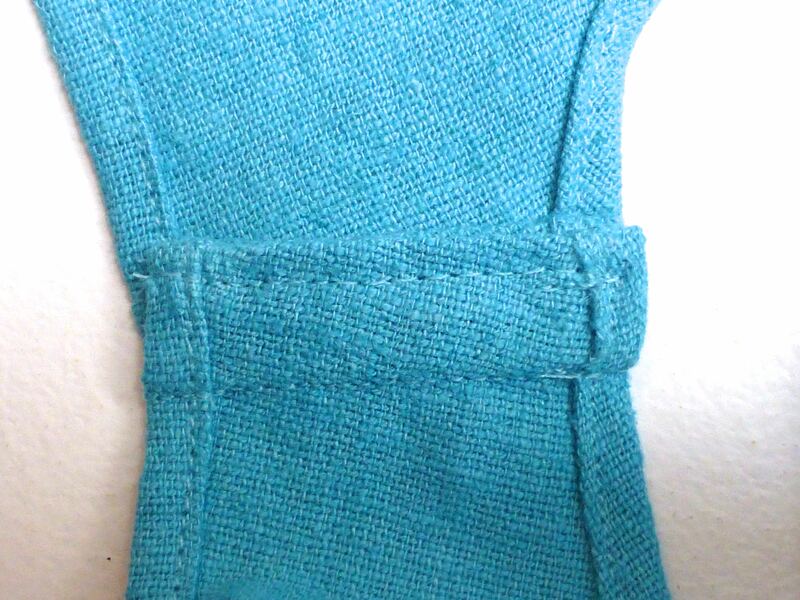 I really like the color of the fabric. Thanks, it’s better suited to us oldies – you can get away with anything at your age, so make the most of it! Wow! What a wonderful dress. 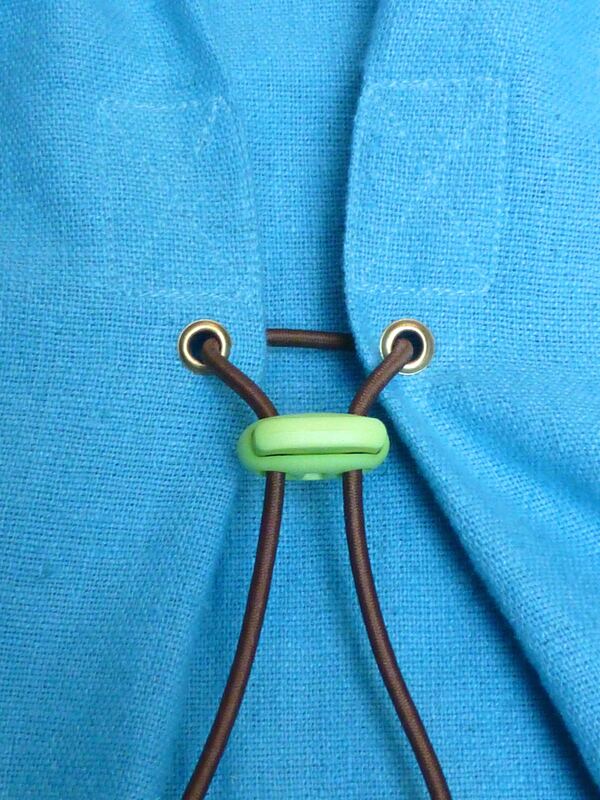 And oh yes, that turquoise, such a great colour. Looks fab on you. Loving the pink fabric too. Look forward to seeing what you make from that. Thanks! I’ve spent the afternoon designing and making a similar style tunic from the ‘Leaf’ linen – the ‘Fuschia’ will almost certainly be a dress of some sort. Thank you, it’s one of my favourite colours too and it certainly is comfy! Oooh I love love how that dress looks! Definitely comfy & stylish! Hope your phone recovers fully and you get your pictures back dear! Thanks Caren, it looks better on rather than on the hanger, doesn’t it? Auntie is definitely not your typical shampoo-and-set pensioner with twinset and pearls!! Thanks Claire, I love it! If Aunty is passing genes around throw some my way please !!!! Thanks Roma, it skims the podgy bits a treat! Isn’t Auntie an inspiration? She’s young at heart and fit too, so is great fun to be around – we had a brilliant two weeks. Thank you, I love simple styles like this and a bold colour makes it stand out from the crowd a little. What a perfect colour match! 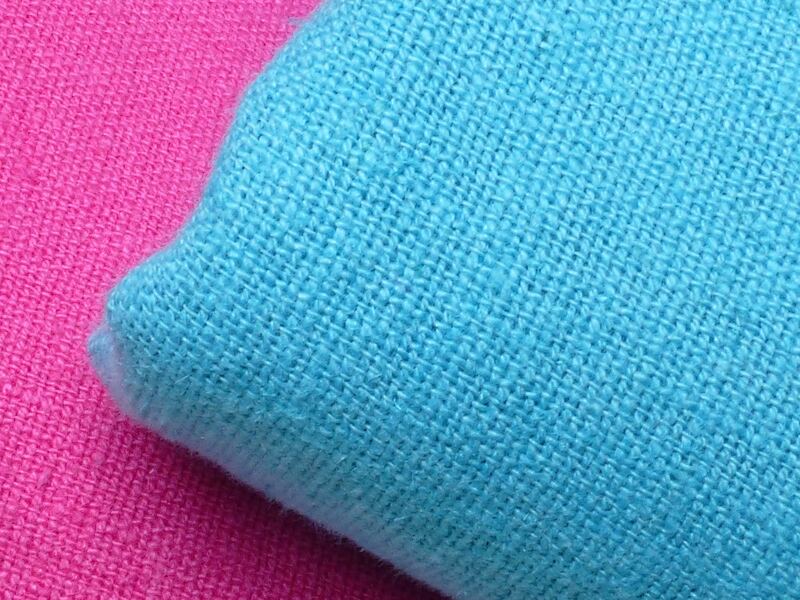 I recently bought a couple of meters of cotton/linen blend and it creases like crazy 😦 anyway your colours are gorgeous! You like bright colours don’t you! Interesting dress, it suits you. Those back pleats are odd though… I’d be tempted to stitch them down too! Your dress is gorgeous and very well done! Yes, I do love linen also. Here, where I live gets very hot and humid. Linen is perfect for this area in the warmer months. Your aunt looks fantastic and has an impeccable sense of style. Thank you, it’s a new favourite and will probably be worn out by the end of the Summer! Auntie is incredible, isn’t she? I know plenty of women in their fifties who look older than she does! Wow! You look fabulous! I love the shape of the dress and the matching shoes are brilliant!! Me too! And a perfect match! I haven’t ever even tried a dress that shape and so I suppose you don’t know until you try! Your Aunt is so cool! She looks amazing!